If you love of track and field and want to share your experiences with Athens area youth, please contact me to discuss possible volunteer opportunities. We need coaches for meets and practices and track enthusiasts interested in helping out at meets or with management. Thank you! All of our coaches recieve an annual back-ground screen and specialized training in youth athletics to ensure the safety and well-being of your children. Rachel Hopkins | Coach Rachel brings a passion for athletics plus a lifetime of experience to the program. Her belief that our youth deserve excellent coaching in a fun encouraging environment inspired the creation of Sirius Athletics. Your child will benefit from over 20 years coaching experience at both the DI and DIII levels along with private coaching at almost every level. While Rachel has worked with some of the nation's top athletes she feels the most important aspect of the program is the satisfaction, camaraderie and FUN your child can have getting stronger and learning new skills. 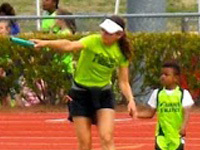 She is a firm believer in teaching proper technique early and smart, steady development over time to ensure a healthy and successful track and field experience. Rachel knows what it takes to excel as an athlete and her career exemplifies the results possible through progressive training over time. Initially, a walk-on at Auburn University, she went on to earn both a scholarship and All-SEC honors. Some post-collegiate accomplishments include competing in the World Track and Field Championships, two Olympic Trials, and placing as the third American in the Boston Marathon. 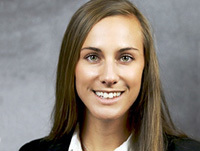 Lisa Williamson | Coach Lisa has been coaching with Sirius Athletics since 2017 and previously served as an Assistant Coach at Clayton State University from 2013-2015 where she coached sprints/hurdles, jumps, and javelin. Prior to Clayton State, she was an Assistant Coach at Ashland University from 2011-2012 assisting with the sprints/hurdles and combined-events. As an athlete, Coach Lisa was a 2x NCAA All-American in the pentathlon and a member of the 2nd place NCAA Division II Indoor Championship team in 2010. She previously held the heptathlon school record for the Eagles, Great Lakes Intercollegiate Athletic Conference heptathlon and pentathlon records, and was an Ohio High School Athletic Association 300 meter hurdle State Champion. Coach Lisa is a certified USATF Level I Coach, USATFGA Association Official, NASM certified Personal Trainer, AFAA certified Group Exercise Instructor, and holds a Master's in Sport Management and Bachelor's in Exercise Science with a minor in Coaching. Alex McQueen | Specializing in the distance events, Coach Alex was a Charlton County stand-out who went on to compete at UGA. He’s a great asset to our team and coaches both track and field and cross country. Alex Poursanidis | We're excited have Coach Alex back for his second season with Sirius Athletics. An All-American and 2-time SEC Champion for UGA in the hammer throw, Coach Alex splits his time between training for world class track and field meets and coaching with Sirius Athletics. Javaris Askin | is a student at the University of Georgia and is pursuing his bachelors degree. He is an Atlanta native and has competed in numerous local and state track & field competitions in his past. He began his track career at the young age of ten and has had strong passion for the sport ever since. He specializes in sprints, relays, and the long jump. Javaris plans to perfect the team's 4x100m hand-offs throughout the season and is excited to work with the team for another year! Lee Patterson | Coach Lee excelled on the track in Texas and Georgia where he was one of UGA’s top 10 all-time 800 meter runners. He now excels as a coach. With a high school coaching certificate and a Cross Country State Champion to his name, he is an valuable asset to Sirius Athletics.